Mother’s Day is almost upon us and to celebrate the occasion, Lord’s is offering two one-of-a-kind gift experiences that are guaranteed to make every mother smile. For the foodie mothers that love sophistication and delectable treats, a traditional afternoon tea package from Lord’s is the perfect gift. With afternoon tea available on certain selected dates, priced at £48, guests can enjoy a traditional cream tea with all the trimmings, including freshly baked scones with homemade jam and Cornish clotted cream, and a selection of finger sandwiches and dainties from the Lord’s resident Pâtissier. For an extra essence of celebration, packages can be upgraded to Champagne afternoon tea which includes a glass of fine Champagne for £59. 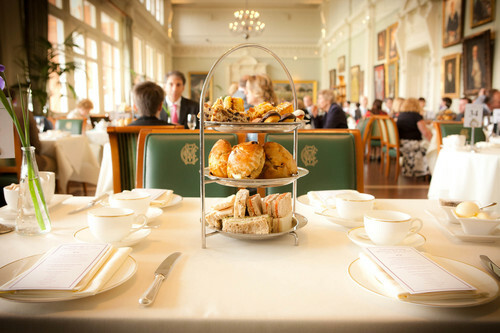 This can all be enjoyed while seated in the iconic Long Room at Lord’s where guests can take in the commanding views of the Ground’s outfield. For the cricket-loving mother, Lord’s recommends a traditional county match day hospitality package starting at £115 per person or £150 per person for a luxury package. Perfect for a cricket-loving family or group of friends who enjoy the atmosphere of a traditional county match, the packages include a tour of Lord’s, tea and coffee on arrival, a scorecard and a three course lunch in the new Pelham’s dining experience. For those looking to splash out, a glass of Champagne, delicious afternoon tea, souvenir gift and an official programme can be added to the package. Between April and September 2017, supporters can choose from a range of exciting fixtures in the Specsavers County Championship including Middlesex v Surrey and Middlesex v Yorkshire. For more information about county cricket match day hospitality, check out the Lord’s website here. MCC is the world’s most active cricket club, the owner of Lord’s Ground and the guardian of the Laws and Spirit of the game. Founded in 1787, it issued the first code of Laws in 1788 and moved to its current home in 1814. There are 18,000 Full and 5,000 Associate Members of MCC. MCC also has a World Cricket committee, which is chaired by Mike Brearley and contains eminent current and former players and administrators – including Sourav Ganguly, Ricky Ponting and Shaun Pollock. It has a remit to act as an independent think tank, debating issues and making recommendations about the health and state of the game and to commission research. MCC owns the most comprehensive collection of cricket artefacts and books in the world, housed in its museum and library at Lord’s which is visited by tens of thousands of visitors from all over the world each year. The current Lord’s Cricket Ground is its third incarnation. The first ever match played at ‘Lord’s Cricket Ground’ came in 1787 when businessman Thomas Lord staged a game between Middlesex and Essex at a newly built ground in what was then known as Dorset Fields. By 1811, MCC had moved to a new Ground in the Eyre Estate of St John’s Wood. This ground proved unpopular but when plans emerged for the Regent’s Canal to be built straight through it, Thomas Lord gratefully accepted compensation and moved the Ground to its current location in 1814. Lord’s has 12 unique spaces which can host meetings, conferences, receptions, dinners and weddings for up to 1,000 people. From the grandeur of the Long Room in the Grade II* listed Pavilion, to the modernity and style of the J.P. Morgan Media Centre, the venue boasts a variety of spaces, many with great views of the pitch. The venue attracts clients from a variety of industry sectors including corporates, associations and agencies. This press release was distributed by ResponseSource Press Release Wire on behalf of Mexia Communications in the following categories: Leisure & Hobbies, Women's Interest & Beauty, Food & Drink, for more information visit https://pressreleasewire.responsesource.com/about.